Our baby boy turned two the weekend before Easter, and we planned his party accordingly. His three-layer cake was alternating layers of Wedding Cake flavor and my Rich Chocolate cakes. The entire cake was filled and frosted with Vanilla Swiss Meringue Buttercream. Pastel pleated polka-dots in varying sizes were then piped onto the sides of the cake as was the B-day message. A simple border was then piped around the edges. The cake was simple, but our birthday boy is Simply Amazing!! He’s also adorable….see for yourself! He loved his cake!!! 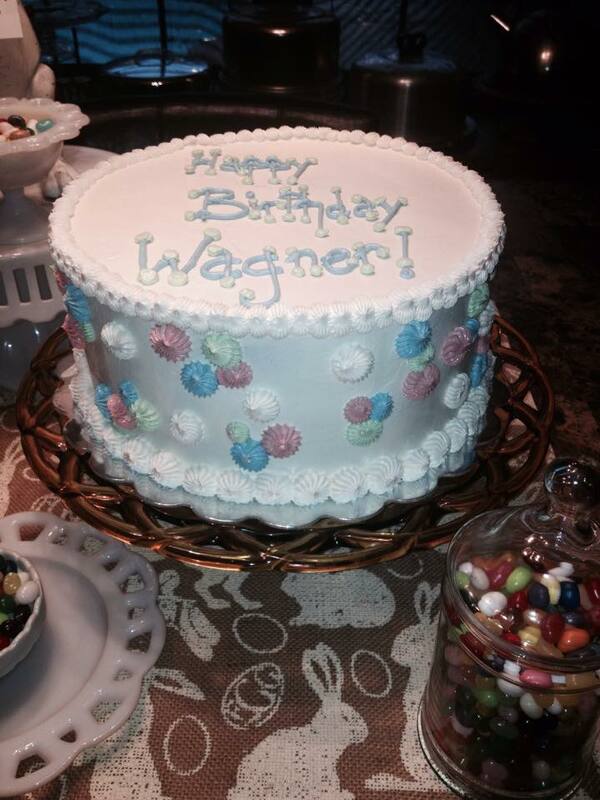 Happy Birthday, Wagner….we love you bigger than the ocean!!!!!! Posted in UncategorizedTagged baby, birthday, boy, buttercream, cakesBookmark the permalink.